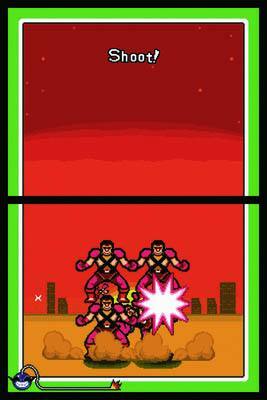 WarioWare Touched is one of the first generation of Nintendo DS games that uses the console to its full advantage through the eyes of one of Nintendo's most insidious characters. The story revolves around Wario’s greedy ambition to make more money off gamers while doing as little actual work as possible (What? You heard right my dear gamers, Wario is trying to use us to make money for his own greedy purposes). The story is fairly wacky, though almost serious compared to the mini-games and told with the same visual creativity of the rest of the game. The characters are rather static, though there are some twists involving larcenous monkeys, alien abductions and Wario’s secret identity. 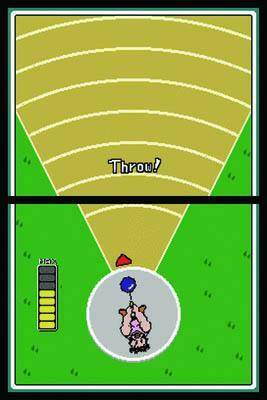 The WarioWare gameplay formula is quite simple and revolves around a few second long mini-games that are thrown at the player, followed by another which is often then followed by another. Fortunately these mini-games are broken up by boss battles that do help break the monotony of the title and periodically the game speeds up, with the process repeating until the player runs out of lives. Touched exchanges the d-pad and A button of the first WarioWare for the touch screen and microphone input. Touched, as its name would imply, depends on the touch screen for control for the vast majority of its mini-games. It starts simply, with the first group of games involving taps on the screen, and as play progresses integrates various gestures, such as lines, dragging items, or quick circular motions. While many of the gestures are similar, the mini-games have very different uses for them, giving the gameplay a good variety. The touch screen is quite responsive and accurate. The microphone had its own group of mini-games and the control during these games tended to be good, with excellent sensitivity to how hard the microphone was being blown on. A problem with the mike games is that many are won by simply blowing as hard as possible. Not enough of them required careful control of intensity and duration. The boss battle in this group was excellent, giving an excellent example of why Nintendo thinks new ways of playing games need to be found. In the game, a little dandelion puff drifts across the screen, slowly losing altitude. Blowing on the microphone causes it to be buoyed upwards. Delicately controlling the puff with little breaths, trying to avoid obstacles, feels very close to actually doing so in real life. Although the Touched graphics are technologically unimpressive, the vast majority are 2-D, though the occasional 3-D bits might challenge the capabilities of a GBA. The sprites are fairly rough around the edges (pixelated) and generally quite simple. This is intentional and part of the WarioWare aesthetic. The visual creativity and execution are excellent. One example that stands out is the mini-game where the player grabs the tongue of a stick figure man, pulls it until the pieces of candy nearby attach, and then lets it snap back into his mouth; his lips close around the candy and curl up into a satisfied smile. These bits of visual polish show up everywhere in Touched, giving the game flavour and the player chuckles (and the occasional “What the hell is that?” moment). The look will probably not appeal to someone that doesn’t like colourful, cheerful and cartoonish graphics. The sound effects in the game are quite adequate, with the sound quality sufficient for the DS speakers and generally add to the atmosphere. There are some inspired choices with the same sly sense of humour as the visuals. The music harkens back to the 8 and 16-bit days, with fairly simple but nonetheless very catchy songs. A couple of the themes can grate on the ears, but overall the music works quite well within the aesthetic. As with previous WarioWares the music speeds up as the games do, giving players a feel for the pace of the game. In conclusion, WarioWare Touched is a fun and unique game which it’s not for everyone but fans of the series will certainly enjoy it. As a demonstration of the capabilities and potential of the DS it succeeds quite well and anyone sceptical of Nintendo’s talk of the need for new ways to play games should give it a try, as it is the best example of Nintendo walking the talk. The whimsical art and sound contribute flavour and amusement while the controls are intuitive, creative, and different from anything on the market.